In 2014, writer Cullen Bunn brought a little darkness to the outer reaches of the DC Universe when he launched new comics focusing on two of our badder cosmic apples: Sinestro and Lobo. With both titles still ongoing, Cullen’s place in the DCU has only expanded since then. In June, he debuted as the new writer of Aquaman and released the first issue of our newest Lantern comic—Green Lantern: The Lost Army. That issue found the Green Lanterns stranded in unknown space without any idea of how they got there and no access to a power battery. Now with the second issue on stands, we thought the time was right to talk to Cullen about this shocking new series. Let’s start with the pretty obvious question. What can you tell us about Green Lantern: The Lost Army and do you need to be familiar with the other Green Lantern titles to understand it? That’s a good question. In Green Lantern: The Lost Army, we find that almost all of the Green Lantern Corps, 99% of them, have been shunted off someplace else. They are lost, they are in a universe that they do not recognize and they do not understand. They have to basically fend for themselves and survive. They don’t know why they’re there. They don’t know who put them there. But they have to find out and they have to survive while doing it. It’s a book that has a lot of the Green Lantern characters that people know and love, but I’m trying to write it in such a way that if you know nothing about the Green Lantern universe, you could come into this book and follow along very easily. So is there a core group of characters? Yes, there’s a core group. There are so many Green Lanterns out there and I can’t focus on all of them, so I’m going to tell the story through the eyes of a core group. 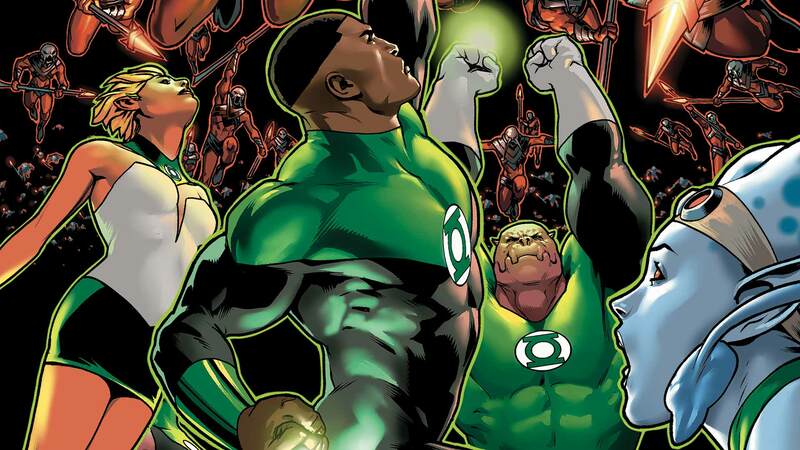 John Stewart, Kilowog and Arisia—they’re all in the group. There are also a couple of new characters who are in the group, and there will be some surprise additions that I think will be interesting that come up. Up until pretty recently you seem to have been focusing on anti-heroes and villains within the DC Universe—the darker characters. Green Lantern: The Lost Army and Aquaman, they’re a little bit of a departure. Were you looking to write some characters that are maybe a little lighter in tone or demeanor after your work on Sinestro and Lobo? Well, I like telling different kinds of stories and focusing on different kinds of characters. You write Sinestro or Lobo, it’s definitely the anti-hero vibe. But I wanted to do some different things and an Aquaman story gives us the chance to do something that is completely different from what we would do with Sinestro, and that’s kind of exciting for me. Same with The Lost Army, I get to focus on a group of characters who are put in a situation that forces them to make some very tough decisions and maybe even some compromises. In that book, it’s completely new territory. There have been some changes to the Green Lantern Universe, new titles starting and others that have wrapped up. Is it exciting to be a part of that? Do you feel like you can go to some fun areas now in the Green Lantern Universe? Yeah, it’s exciting to be a part of. It definitely gives us the opportunity to do a lot of— I was going to say world building, but really, universe building, you know? With Lost Army, I get to explore a completely different universe. The Lanterns should be characters who can go anywhere and see anything, and that’s really where we are with it now. GREEN LANTERN: THE LOST ARMY #2 by Cullen Bunn and Jesus Saiz is now available in print and as a digital download.